We all know Kissmetrics is a highly popular analytics tool that is currently being used by many leading companies to track their website visitors. However, it is still far behind Google Analytics in terms of overall usage stats. That’s because Google Analytics is available in the market since many years, and for Kissmetrics, it been a journey of only a few years. But what makes Kissmetrics different from Google Analytics is its intuitive interface, and super striking features that helps you track people across multiple devices, the source they have come from, when an old visitor become your paid customer, and much more. In case of Google Analytics, its interface has been changed only a few months back, and many new features have also been added to it, which makes it a brutal force to combat against Kissmetrics. 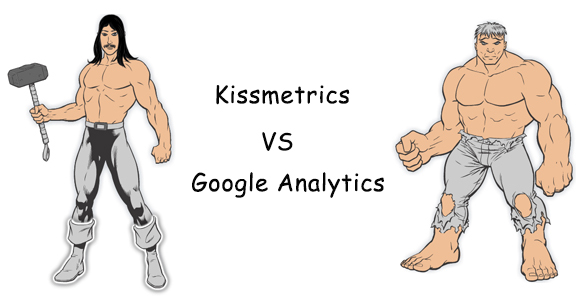 And recently, to know how these two perform on Social networks, we analyzed the twitter accounts of Google Analytics and Kissmetrics, which show that the battle between the two is getting interesting day by day. To know the stats we found in our research just go through the infographic shown below. It also consists of certain brand names that are using Kissmetrics or Google Analytics to track their website hits.